Eyes of the Day / Gee Whiskers! I love purple and thought I'd share my quick purple day time look with all of you - it takes me about 2 minutes in the morning. I don't fuss around with foundations and lipsticks. I usually only spend time on doing my eyes in the morning before running out to work. 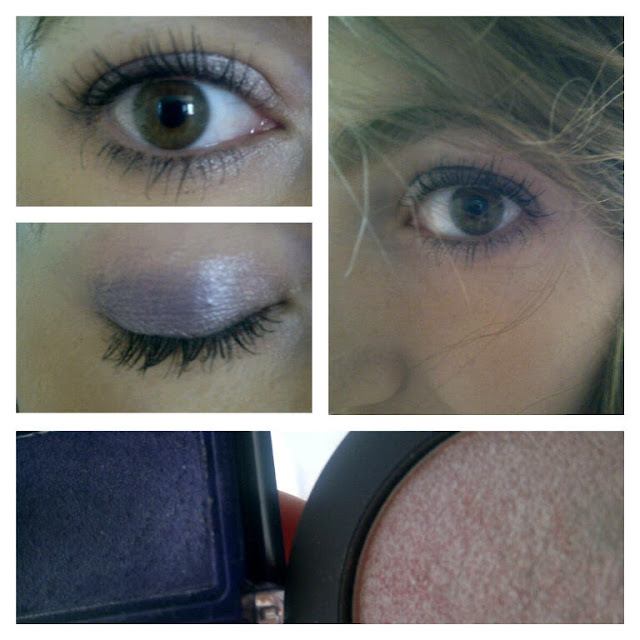 Essence Smokey Eye Duo in Purple Maniac which was R34.99 when I bought it from Clicks. Prepare your eyelid with either an eyeshadow primer or normal face powder. I prefer using a face base powder. Cover the entire eyelid with the soft pink eyeshadow because the light colour creates a good base for the purple to really make it pop. Apply the purple eyeshadow to the out corner of your eyelids blending into the corner of your eye. You want it to be quite light when reaching the inner corner of your eye. Once you are happy with the purple take a bit of the Soft pink and highlight the inner corners of your eyes and blend around the crease of your eye to soften the purple. I like to apply a little bit of the soft pink under my bottom eyelids. Apply your favourite mascara. I used Rimmel's ScandalEyes today because it was the first mascara that I grabbed this morning. For a night time look make the purple a little darker and line your bottom eyelids with a dark purple or black eye pencil. Add a little more shimmer to your inner and outer lids to reflect light more. I am by no means a makeup artist, nor am I pretending to be one. All the looks I share will be very simple and easy to do. Very pretty :) I also tend to wear purple eyeshadow quite a lot. I think purple looks good for all eye colours. :) I have a weird mix of brown and green so purple brings out the colours. That looks stunning Charlene!! Love the new idea! I am SO boring with my makeup so it's great to have someone inspiring like you to give me some quick and new ideas! Thanks hun! I'm definitely trying this one tomorrow! So simple, yet SO effective!